Alox Limited Edition 2019 of the classic Victorinox Classic, multipurpose 5-function 58 mm long (closed). Grips in Alox Gold, made of anodised aluminum and subsequently subjected to the Eloxal process which, using anodic oxidation, creates a protective layer capable of preserving from damage and corrosion. The program of the Alox Limited Edition foresees the realization of three models (Classic, Cadet and Pioneer) with anodised aluminum cheeks in different colors, different each year: the latter will be shown on the same cheeks. The knife is presented in an elegant cardboard box. Alox Limited Edition 2019 of the classic Victorinox Cadet, multi-purpose 9 functions of 84 mm in length (closed). Grips in Alox Gold, made of anodised aluminum and subsequently subjected to the Eloxal process which, using anodic oxidation, creates a protective layer capable of preserving from damage and corrosion. Alox Limited Edition 2019 of the classic Victorinox Pioneer, multipurpose 8 functions 93 mm long (closed). Grips in Alox Gold, made of anodised aluminum and subsequently subjected to the Eloxal process which, using anodic oxidation, creates a protective layer capable of preserving from damage and corrosion. Multipurpose robust 111 mm with 18 functions. For wonderful, relaxing and surprising days at sea, you need a splendid, relaxing and surprising instrument. That's why we have developed the compact Skipper Pro tool, so that it can offer the capabilities of an entire crew in the palm of your hand. It is equipped with the typical Victorinox functions and combines a lockable blade with a specific tool for navigation, indispensable for any nautical adventure: a sturdy, loose lockable knots. We have equipped our model with a bright orange lanyard which makes it visible even in the middle of a storm and we have made sure that it has everything you need to tackle obstinate knots and carabiners. The classic Spartan grips with camouflage. The classic Huntsman, now with walnut wood grips! Functional and elegant, the Swiss Army Knife Huntsman Wood has 13 essential functions and features a slender line, encased between cheeks of elegant and durable walnut. With wood that gives a feeling of artisanal care pleasant to the touch, each instrument is unique, thanks to the natural grain of the material. But do not think that this knife is a fickle type: it is a noble and light companion made for everyday use and everyday adventures, and you can carry it both in your pocket and in a toolbox. Multipurpose robust 111 mm with 17 functions. Multi-purpose tool made entirely of stainless steel with a skeleton structure. It has 154CM steel blade and offers compact dimensions for maximum ease of use. It weighs in fact only 140g. and when closed it has a length of 105mm. Multipurpose 91 mm with red cheeks Cellidor with cross has 33 functions. NTK10 is a brand new unibody titanium utility knife constructed via detail-oriented titanium machining. With strong rigidity, low density and high corrosion resistance, titanium alloy is ensured with a premium quality and widely used in outdoor gears as well as aerospace components. NTK10 is equipped with a replaceable OLFA CKB-2 blade, which is produced by one of the top manufacturers of cutting tools with the highest quality and the most durable materials. The easy purchase and simple operation offer a convenient replacement of blades. 30-degree comfortable grip guarantees the cutting stability and precision. The retractable and smooth mechanism makes it one-handed operable for blade adjustment. The multiple locking grooves allow a free control of blade length with sharp precision while the blade lock keeps the blade away from accidentally sliding out of the body. With an exquisite and compact body, NTK10 also has three areas of grooved edge design which increase the friction of the grip to prevent accidental drop of the knife. The dismantlable clip is perfectly applicable for drawing out and outdoor carrying. In case of an emergency, use the tool to break the four corners of the window glass to enable a possible means of escape. The unique bottle opener feature is able to let you enjoy the extraordinary moment after your breathtaking adventure! Alox Limited Edition 2018 of the classic Victorinox Classic, multi-purpose 5 functions 58 mm long (closed). Red Raspberry Alox cheeks, made of anodized aluminum and then subjected to the Eloxal process which, using anodic oxidation, creates a protective layer able to preserve from damage and corrosion. The program of the Alox Limited Edition involves the construction of three models (Classic, Cadet and Pioneer) with anodized aluminum grips in different colors, different each year: the latter will be shown on the same grips. Alox Limited Edition 2018 of the classic Victorinox Cadet, multi-purpose 9 functions with a length of 84 mm (closed). Red Raspberry Alox cheeks, made of anodized aluminum and then subjected to the Eloxal process which, using anodic oxidation, creates a protective layer able to preserve from damage and corrosion. The inspiration behind the KEY-BAR was the annoyance of the noise and disorganization of the many keys that creator Michael Taylor carries daily. In his workshop one weekend he decided to do something about his problem. After many hours of research, trial and error and several prototypes later, he arrived at the current version of the KEY-BAR. No special tools are necessary for assembly. All KEY-BARs are CNC milled from solid billet then hand finished to order. Every KEY-BAR is 100% non-ferrous and all hardware is stainless steel so your KEY-BAR will not rust. The philosophy behind Key-Bar is simple and the result of a need: daily carry your keys in your pocket without the latter make noise and move anywhere creating hassles. Then enters the scene creativity and inventica Michael Taylor who, after many hours of research and creation of prototypes in his small workshop in Savannah, USA, invented Key-Bar. A small keychain drive, configurable at will, that allows keys to be always in order, not to emit noise during transport and anchored fit comfortably within your pocket or attached to your belt. The development of Key-Bar is just beginning, but its potential is enormous. And 'you can separately purchase additional accessories to be included along with keys that allow the creation of a small multi-tool ready for any eventuality daily! No special tools are required to assemble and configure your Key-Bar; all handles are made from solid billets of material and CNC machined and then finished by hand. Each Key-Bar is made with non-ferrous materials, while the screws are stainless steel, so as to ensure the maximum dell'igene and extreme ease of cleaning and maintenance. The philosophy behind the Key-Bar is simple and the result of a necessity: carry your keys daily in your pocket without them making noise and moving anywhere creating discomfort. Then enter the stage of the creativity and inventiveness of Michael Taylor who, after many hours of research and prototyping in his small workshop in Savannah, USA, invented Key-Bar. A small rigid keychain, configurable at will, which allows the keys to always be in order, not to emit noise during transport and to be easily anchored inside your pocket or attached to the belt. The development of Key-Bar is only just beginning, but its potential is enormous. In fact, it is possible to separately purchase additional accessories to be inserted together with the keys that allow you to create a small multi-purpose tool ready for any eventuality every day! No special tools are required to assemble and configure your Key-Bar; all the handles are made of solid material and CNC workbenches and then finished by hand. Each Key-Bar is made of non-ferrous materials, while the screws are made of stainless steel, in order to guarantee maximum hygiene and extremely easy cleaning and maintenance. The most popular of the Leatherman pliers is now available with a new version further improved thanks to the addition of interchangeable and resistant cutters. Includes Bit Kit with: Square Drive #1 & #2, Eyeglass screwdriver, Hex 5/32 & 9/64", Hex 1/8" & 7/64", Hex 3/32" & 5/64", Hex 1/16 & .050", Phillips #1-2 & 3/16" Screwdriver & Screwdriver 1/8" & Torx #15. The Charge Plus caliper model stands out as an evolution of the Charge AL model, characterized by the new anodized 6061-T6 aeronautical aluminum handle and the addition of interchangeable and more resistant cutters. Phillips # 1-2 screwdriver and Cigarette 3/16 "
Get ready to explore new paths or conquer new markets with this robust and elegant multipurpose. Equipped with a large blade with a bold look, the Swiss Army 1 is inspired by the adventurous spirit of great travelers. Thanks to two strong cheeks in Alox, it's a nice feeling to hold it in your hand, and an even more beautiful when, once again, you'll have solved the situation. Stay well equipped as you jump from one day full of satisfactions to the other with the multipurpose Rambler. It is full of indispensable tools like scissors, two screwdrivers and much more. Despite all the features enclosed in his cheeks, he still has a slim figure that easily slips into your pocket. In the Spartan series a novelty has arrived: Spartan PS, with its instruments and its parts elegantly made in black thanks to a process known as Polispectral. The instruments boast a special coating that changes appearance depending on how the light strikes it, going from dark gray to anthracite, with an exclusive surface finish that shines and is smooth as a mirror. We have added a black lanyard and enclosed the whole between two black or white cheeks to offer a monochromatic version of our Swiss Army Knife. Japanese multipurpose made of blade, scissor and file, inserted inside two coins that faithfully reproduce the Japanese Yen coined during the Meiji period 1870-1914. The Tread LT is the leaner version of the standard model. Leatherman Tread is an innovative bracelet that integrates a practical multi-tool system. Each single jersey that makes up the bracelet is equipped with up to three different tools and allows you to always have the right tool at your fingertips. 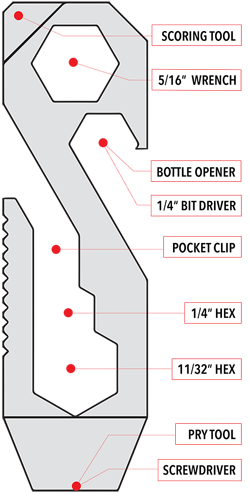 Entirely built in 17-4 stainless steel, it weighs 156 grams and offers up to 29 different functions such as screwdrivers of various sizes and shapes (flat-tipped, Phillips and Hex), keys (hexagonal, square and for cylinders of oxygen), bottle opener, wire strippers, cutting hooks and even a skull crasher. The bracelet is totally configurable according to your needs since the single links are connected to each other by two steel bridges and fixed with pairs of screws that can be dismantled with a simple coin. Three-in-one functionality, high-quality finish and great ease of use: take Victorinox Wine Master with you and enjoy outdoor adventures with the taste of good life. The long and sturdy spiral firmly grips the cap, the aluminum size ensures clean and precise cuts and the solid two-stage lever protects from slipping, ensuring a safe removal of the cap. Finally, a knife with an extra high blade, which can make its way into all your favorite picnic snacks, is the final touch that makes Wine Master the perfect multi-purpose tool. You can see refinement in the ideal action of the fulcrum and in the precision of the details, which minimize the effort required. The cheeks are finished in a selection of precious olive or walnut wood, and combine a comfortable grip and an elegant look. All of this makes Wine Master an exclusive gift, which immediately fascinates wine lovers and becomes their loyal companion. Robust multi-purpose knife / sommelier corkscrew manufactured by the Swiss company Victorinox characterized by the walnut wood handle. Equipped with stainless steel ring. With the Snailor in your keychain you will always have a nice and very useful bottle opener tool and a drink companion with you. This nice lumachina has become so famous and demanded that Jesper Voxnaes is no longer able to make it artisanally in adequate quantities to meet their demands! In a small tool to have in your belt, in your pocket or attach to a key ring, 11 functions other great multitool. Victorinox 111mm in length with 12 functions. Features such as "liner lock" lock on the blade and the tool screwdriver / bottle opener. With the Boker Camp Knife, one of the forefathers of all modern multi-purpose pocket knives, our history Began in the year 1869. After almost 150 years of successful market presence, the time came to convert this proven concept into a modern knife. The modernized construction, Which is based on solid steel liners, is embedded in two contoured handle scales, made out of black G-10. The Swedish Sandvik 12C27 steel, with a Rockwell hardness of 58-60 HRC, Provides outstanding edge retention of the hollow ground blade. The high quality manufacturing, with a smooth blade action and optimized operability, are proof of the premium quality of our Boker Plus Tech Tools. The philosophy behind Key-Bar is simple and the result of a necessity: daily carry your keys in your pocket without the latter make noise and move wherever creating hassles. Then enters the scene creativity and Michael Taylor inventica that after many hours of research and prototypes achievements in their own small workshop in Savannah, USA, invented Key-Bar. A small keychain drive, configurable at will, that allows keys to be always in order, not to emit noise during transport and fit comfortably anchored within your pocket or attached to your belt. The development of Key-Bar is just beginning, but its potential is huge. And 'you can separately purchase additional accessories to be included along with the keys that allow you to build a small multi-tool ready for any eventuality daily! No special tools to assemble and configure your Key-Bar; All handles are made from solid billets of material and CNC machined and then finished by hand. No special tools are required to assemble and configure your Smart Key, just a coin to tighten the screws; compatible with keys flat type, length from 55 to 80mm. Also in the new version Torx, the Get-A-Way Driver proves an indispensable travel companion for those who want to always be ready for any eventuality. The cutlery Spork by Light my fire is made of titanium, one of the most durable materials on the planet. Titanium is widely used in aircraft construction for its extreme lightness and strength, but is also used in surgical implants and dental. Its high biocompatibility means that is non-toxic and is not rejected by the body. An object useful in your next outing, no matter where you are. 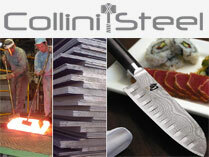 Hypoallergenic, resistant to corrosion and oxide and is not magnetic. Smooth surface, no metallic taste in the mouth. Spoon-fork-knife with serrated blade on the side of the fork. Heat-resistant material does not deform in hot / boiling. Extremely durable and dishwasher safe. Pioneer X is the first knife Pioneer absolute to have a pair of precision scissors. They are perfect to open packaging, cut wire, cut out objects and much more. Are a great element to a pocket knife that already includes a versatile steel blade, a sharp reamer and many other features that you'll find all the same subject of beautifully designed, durable and designed to last. * Hex Wrench 1/4 "
Designed for hiking and for life in nature, it provides for the first time on a product Leatherman convenient kindling, an emergency whistle and a diamond sharpener. This new version of Swiss Card will take care of your nails thanks to the many tools inside always at hand. All KEY-bars are CNC milled from solid billet then a hand finished to order.